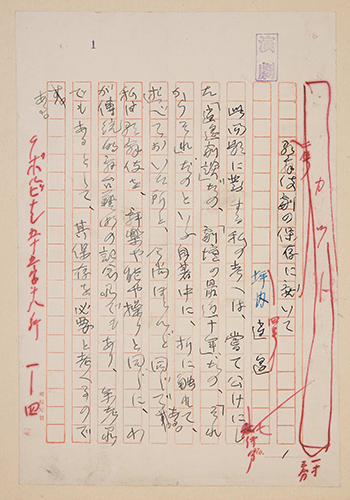 Shōyō wrote the manuscript “On the Preservation of Kabuki Drama” in late March 1924 at the request of Yamamoto Yūzō, the editor of Engeki shinchō, and the essay was published in the journal in June of that year. In his essay, Shōyō addresses what had become for him, by the 1920s, a seminal problem: kabuki was treated as a single art (like nō theater) but, Shōyō felt, the dramatic form had changed significantly over time, from its origins in the early seventeenth century through the early twentieth century. Thus before one could address how to preserve kabuki one needed to determine which aspects of the dramatic art ought be persevered as most representative. Shōyō’s own stance was clear: the “zenith” of the art was in the late eighteenth century and what followed—from the early nineteenth century onward—was a gradual decay. Thus preservation was perhaps not the right word since what Shōyō sought was really to revive the form of kabuki that had disappeared already over a century earlier. Shōyō had developed an interest in questions related to the preservation (hozon) of kabuki in the late 1880s and it would remain a concern across his career as playwright, critic, and historian of drama. And yet the timing of “On the Preservation of Kabuki Drama” is also interesting from a historical perspective. The piece was written just six months after the Great Kantō Earthquake destroyed large sections of the city of Tokyo and many writers—Akutagawa Ryūnosuke chief among them—lamented the loss of cultural heritage that resulted from the earthquake and resulting fires. When the earthquake hit on September 1, 1923, Shōyō was at Waseda University in a meeting with Takata Sanae, the University’s president, discussing an exhibition of theater material that was to be held in October. Within days of the earthquake, Shōyō had decided to donate his own private collection of books and theater ephemera to Waseda, the university at which he had taught his entire career. In 1928, with the help of students, friends, and the university, Shōyō was able to realize his long-term goal of creating a theater museum on the campus of Waseda University. The Museum was intended “preserve, as a form of history, Japan’s theater which is incomparable in form in the world and which has developed along a unique path.” Thus while Shōyō may not have achieved his idea of preserving kabuki of the late eighteenth century as a living dramatic art, today the Waseda University Tsubouchi Memorial Theater Museum plays a critical role in preserving the history of kabuki through an unparalleled collection of archival materials. 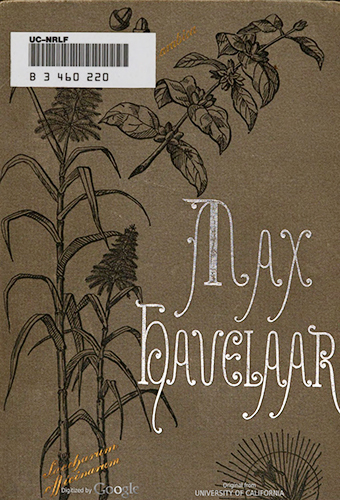 Cover of UC Berkeley’s 1881 edition of Max Havelaar. The Dutch Studies Program at the University of California, Berkeley was introduced as a permanent curriculum in the Department of German in autumn 1966. With the introduction of the Queen Beatrix Chair of Dutch Language, Literature & Culture in 1971, a degree Program in Dutch studies was launched, eventually leading to a Dutch Major. In 1982 a second endowed chair was introduced: the Peter Paul Rubens Chair for Flemish Studies. It was the first Flemish chair endowed in the United States by the government of the Flemish Community in Belgium. This enrichment of the Dutch Studies Program allowed a significant expansion of its course offerings by the annual appointment of outstanding faculty from Flemish universities as visiting professor for a semester. 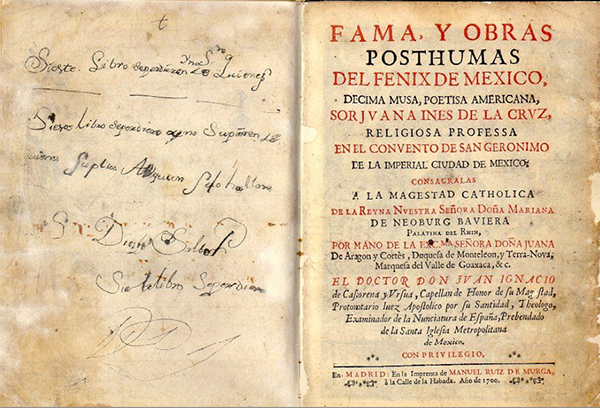 UC Berkeley Libraries have been collecting Dutch language material from its earliest years, across disciplines, especially in the history of Europe, the formation of the Netherlands, socialism, Dutch East Indies, and Suriname. Berkeley then began to offer a graduate degree in Dutch Studies in 2013. Imprint: Rotterdam : Uitgevers-maatschappy “Elsevier”, 1881. 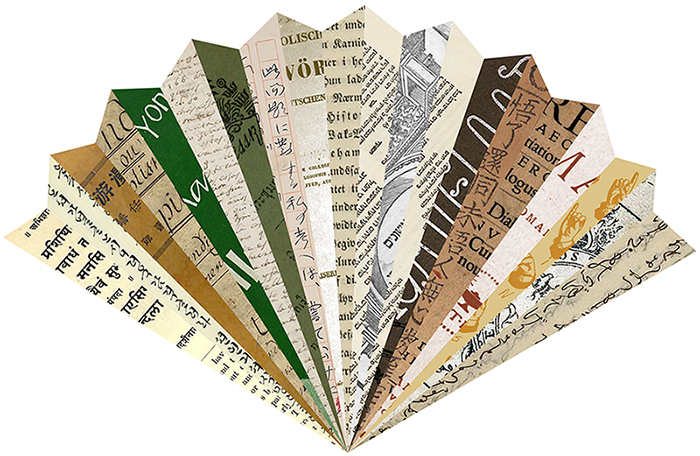 More than two dozen editions of Max Havelaar are available in the UC Berkeley Library in Dutch but also in Indonesian, German and English translation. Swahili, a Bantu language in the Niger-Congo, is the lingua franca of the African Great Lakes region and other parts of eastern and southern Africa. According to the most recent 2015 Ethnologue estimates, there are just over 98 million speakers – 16 million first language speakers; 82 million second language speakers. It is the official language of Tanzania and one of at least two official languages in Kenya, Democratic Republic of the Congo, Rwanda, and Uganda. Swahili is also listed as an official language of the African Union. Originally, Swahili was written in Arabic script and borrows many words from the language, a result of strong regional ties to the Arab world via trade and religion. The earliest known Swahili documents were discovered on the Indian Ocean island of Kilwa along the Swahili Coast, which consists of the coastlines and nearby islands of present day Kenya, Tanzania and northern Mozambique. The island of Pemba is also located within the Swahili Coast, which was the home of Kamange and Sarahani, the authors of the poetry found in Kale ya Wahairi wa Pemba: Kamange na Sarahani (The Past of Pemba Poets: Kamange and Sarahani). Kamange and Sarahani were contemporaries and fierce rivals during the latter-half of the nineteenth century until their deaths in the early twentieth century. Both were well regarded along the Swahili Coast. Kamange often took up subjects like love and bravery while Sarahani chose religious topics and moral instruction. Among their influences were the culture and environment of the region. Since both were Muslim, they were also influenced by Islamic literature and the Arabic language, all of which comes out in their writings. Recognizing the cultural significance of the collection of poetry, Abdurrahman Saggaf Alawy (author of the preface, Shukurani) and Ali Abdala El-Maawy (author, along with Alawy, of the forward, Dibaji) kept the poems safe during the turbulent period during and immediately following the 1964 revolution in Zanzibar. They safely stored the collection for more than 40 years before presenting them to Abdilatif Abdala, editor of this volume, for publication. Swahili was first offered at UC Berkeley in 1979. Today, elementary through advanced Swahili is offered each semester by Professor David Kyeu. Over the last several years, Swahili enrollment on campus has remained steady with an average of 42 students enrolled each academic term. To support Swahili language use and practice, the Center for African Studies at UC Berkeley hosts a weekly Swahili Language table where Berkeley students as well as members of the larger community can practice and improve their language skills. Imprint: Oxford: African Books Collective, 2012. Anthology of Swahili poetry = Kusanyiko la mashairi / Ali Ahmed Jahadhmy. Nairobi: Heinemann Educational Books, 1975. Dhifa / E. Kezilahabi. Nairobi : Vide-Muwa Publishers, 2008. Sauti ya dhiki / Abdilatif Abdalla. Nairobi : Oxford University Press, 1973. Taa ya umalenga / tungo za Ahmad Nassir ; zimehairiwa na Abdilatif Abdalla. Nairobi : Kenya Literature Bureau, 1982. Taaluma ya ushairi / Kitula King’ei na James Kemoli Amata. Nairobi : Acacia Stantex Publishers, 2001. It would not be an exaggeration to say that the Tirukkural holds the same status in Tamil culture that Confucius’s Analects hold in the Chinese and Sadi’s Gulistan holds in the Persian cultures respectively. Not only is the Tirukkural considered a masterpiece of literature but is also seen to embody the essence of Tamil ethics, virtue, and morality. 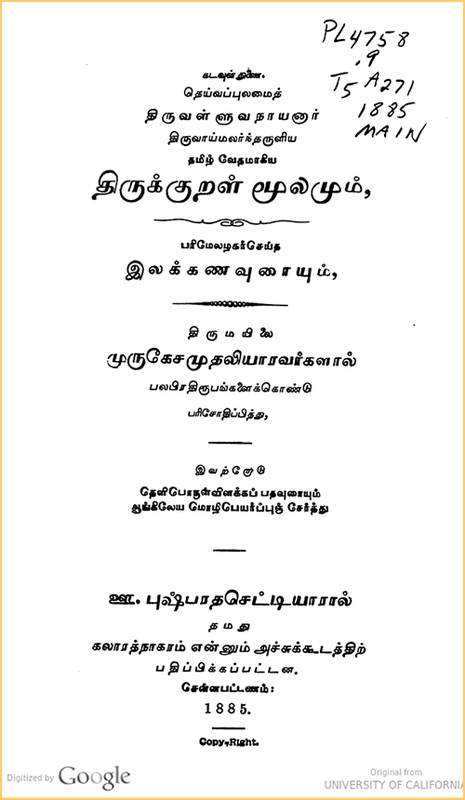 A copy of the text can be found in nearly every Tamil home and verses from it are frequently quoted. In fact, it is so revered that one can take an oath on it in Tamil courts of law. Despite such reverence, very little is definitively known either about the work’s author or the context of its production. Traditionally, it is attributed to Tiruvalluvar. The prefix tiru in both Tiruvalluvar and Tirukkural is the Tamil equivalent of the Sanskrit sri and roughly means holy or sacred. Hence, the name of the reputed author is Valluvar. It is said that Tiruvalluvar, or Holy Valluvar, was a humble weaver who, despite his humble origins and implied lack of formal education, was so sagacious, pious, and holy that he perfectly captured the very essence of ethics, virtue, and morality, in fact the very essence of dharma, in short pithy poetic couplets that remain unsurpassed to this day. Tiruvalluvar is generally believed to have lived in the 2nd century BCE, although there is no hard historical evidence for this and he might have lived any time between the 2nd century BCE and the 7th century CE. There is also no agreement on the place of his birth and exact religious affiliation. Nearly every major religion and sect in Tamil society has laid claim on him. Buddhists and Jains point to the similarity of Tiruvalluvar’s ethical teaching and the ethics of their respective traditions. Some Christians claim to see a Christian influence on him and declare him to be a disciple of St. Thomas the Apostle, who is traditionally held to be buried in Tamil Nadu. Even among Hindus there is no agreement on whether Tiruvalluvar was a Shaivite or Vaishnavite. Yet all appreciate his insights and their literary style. The title of the work, Tirukkural, refers to this pithiness of the poetic couplets as kural literally means short, brief, concise or abbreviated. The work can thus be described as a set of poetic aphorisms. The meter used for the couplets is venpa, which is a very short meter. The text covers 133 topics each with 10 couplets dedicated to it giving a total of 1330 couplets. The topics are broadly related to three themes and thus divided into three sections. The first covers aram (virtue or dharma), the second deals with porul (wealth) and the last section is about inbam (love and enjoyment). These three sections cover the four main aims of human life as understood by Hindu sages. In Sanskrit they are called dharma (virtue, religious ethics), artha (wealth), kama (physical enjoyment), and moksha (salvation). The section on aram deals with both dharma and moksha, while the section on porul deals with artha, both at the individual and at the social and political level, and the section on inbam deals with kama. In the traditions and legends related to Tiruvalluvar, another important person connected with his work is his wife Vasuki. Not only was she an ideal wife but was also wise and holy like her husband. She became a means and medium for many of the teachings about an ideal married life, relations between spouses, patience, and forbearance. It is through her that Tiruvalluvar was able to give the answer to the question of whether salvation can be achieved while being a married member of society or does one have to renounce all social, especially marital, relations. Tirukkural was first translated into Latin by the Italian Jesuit missionary Constanzo Beschi in 1699. As interest in Tamil culture and the Tamil language grew, it was subsequently translated into a number of European languages including English. Among these is the translation featured here that includes commentaries by respected Brahim scholars. Until recently, the University of California, Berkeley was the only university in the United States to have a chair in Tamil Studies. From the very beginning of the Department for South & Southeast Asian Studies Tamil was one of the primary languages offered by it. World-renowned scholars, like Murray Barnson Emeneau, made Cal famous for the study of Dravidian and Indian linguistics. In 1975 Prof. George Hart joined as the Professor of Tamil and remained the holder of the Tamil Chair until his retirement a few years ago. His wife Kausalya Hart was the Tamil language instructor on campus and together they wrote Tamil textbooks that are still widely used. Prof. George played a key role in having the Indian government formally declare Tamil to be a classical language in 2004. Prof. Hart’s scholarly research on Tamil and Tamil literature earned him many awards and accolades including the Padma Shri, India’s third highest honor. Berkeley is set to continue its fine scholarly tradition in Tamil Studies as it looks forward to welcoming a new Tamil professor in a few months’ time. At the same time, Tamil language instruction continues to be provided by Dr. Bharathy Sankara Rajulu. Imprint: Madras: W.P. Chettiar, 1885. Print editions at Berkeley: Tiruvalluvar, John Lazarus (trans.). The Kural of Tiruvalluvar. Madras: W.P. Chettiar, 1885. Ferdowsi’s Shāhnāmah employs the least Arabic loanwords, despite the fact that during the time of its composition, a considerable number of Arabic terminologies were adopted by the Persian language and used in the ordinary language. Many commentators including Mohammad Djafar Moïnfar, claim that Ferdowsi consciously and intentionally avoided using Arabi terms due to existing hostile political circumstances. According to Moïnfar, Shāhnāmah “contains 706 words of Arabic origin occurring a total of 8,938 times”. In fact, the emphasis of Shāhnāmah on the Persian language listed the book among the greatest nationalist books of Persian classic literature. Encyclopedia Iranica, retrieved from http://www.iranicaonline.org/articles/shah-nama-06-dastan. Hamid Dabashi, The World of Persian Literary Humanism (Cambridge, Mass: Harvard University Press, 2012), 91. Encyclopedia Iranica, retrieved from http://www.iranicaonline.org/articles/sah-nama-v-arabic-words. “As for the place of origin, the scribe was evidently of Iranian background and training, even if living in India, while the paintings are clearly to be distinguished as Indian. It seems that the calligrapher and painter (there were at least two of them) did not work in the same period” – from description of F. Abdullaeva. Edition: Origin: As appears in colophon on p.1236/fol.615b, copied by ʻAbd al-Qādir Sāvajī al-Qazvīnī with transcription completed 7 Jumādá II in an unspecified year. F. Abdullaeva, Oleg Akimushkin, and Philippa Vaughan refer the manuscript’s production to the latter 16th or early 17th century. A manuscript copied in Herat (c. 1444) for the Timurid Prince Muhammad Juki (1402-1445) has been digitized by the University of Cambridge. A manuscript Copied by Qiwām ibn Muḥammad Shīrāzī in 998 H [1589 or 90], likely produced in Shīrāz, has been digitized by Princeton University Digital Library. A collection of thirteen extremely rare illustrated lithographed digital editions of Ferdowsi’s Shahnamah are available through the Library’s access to Brill Online Primary Sources. In this collection, the oldest copy is imprinted by Muḥammad Mahdī Iṣfahānī, in Bombay, India(1262 ). A manuscript imprinted in Iran (1430) and calligraphed by Ja’far has been digitized by the Library of Congress. 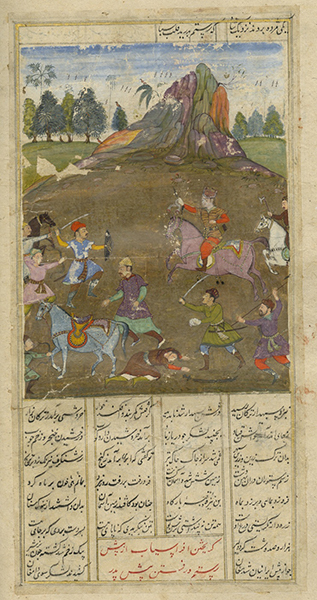 Digitized Illustrations of Shāhnāmah, British Library. Many editions and translations can be found through OskiCat. The most precious is an abridged manuscript of Shāhnāmah in prose believed to be created in India in the early 17th century and is housed in The Bancroft Library. Title page (left) and illustrated page (right) from the Library’s 1939 Shanghai edition. The concept of “children’s literature” was virtually foreign when Chao’s translation of Alice’s Adventures in Wonderland first appeared in China. Traditionally, children of the literate classes learned to read by memorizing and copying out primers, like the Three Character Classic 三字經, gradually moving on to the Confucian canon, dynastic histories, and standard compendia of classical literature. What fiction they read was written for adults. This changed with the May Fourth Movement of 1919, which called for a number of reforms, including the use of vernacular, rather than classical, Chinese in all forms of writing. Some of the movement’s leaders further called for the development of a literature written for children, whether to free them of the intellectual constraints of traditional education, or to give them a psychological space of their own. First published in 1922, Chao’s translation of Alice can be viewed as an answer to both calls. Alisi is not simply an historical artifact, however. As a linguist (albeit one who took degrees in mathematics and philosophy from Cornell and Harvard), Chao understood well the challenge of Carroll’s language—the puns, jingles, nonsense words of inexhaustible significance. How were these to be rendered in a written vernacular associated with any number of dialects, all abounding in homophones, linguistically and culturally unrelated to Victorian English? It is Chao’s solution to this challenge that continues to impress scholars and tickle readers almost a century after the book’s publication. Chao joined the Berkeley faculty in 1947. Among academics, he is best remembered for his Grammar of Spoken Chinese, but it is only one in a long string of scholarly achievements that earned him two honorary doctorates in addition to other distinctions. Outside academia, he is also remembered as the translator and unnamed co-author of his wife Yang Buwei’s How to Cook and Eat in Chinese, and as the man who wrote music for Liu Bannong’s verse “Tell Me How to Stop Thinking of Her” 教我如何不想她. His papers are housed in the University Archives at the Bancroft Library. Imprint: Shanghai: Shanghai yin shu guan, 1939. Source: English-Chinese edition published in 1988 through the Library’s subscription to Chinamaxx (requires Adobe Flash). Other digital editions: Through Library’s subscription to Chinese Academic Digital Associate Library (CADAL) but requires free account creation and Flash). Print editions at Berkeley: Shanghai: Shang wu yin shu guan, Minguo 28  and Beijing: Shang wu yin shu guan, 2002.